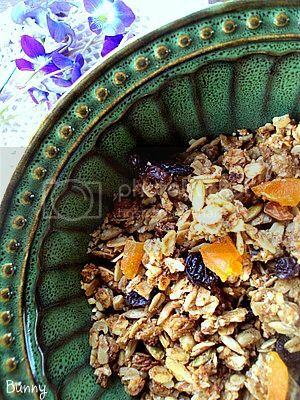 Bunny's Warm Oven: Megan's Granola Recipe , The Best Granola EVER! Megan's Granola Recipe , The Best Granola EVER! I never pictured myself making granola. But when you're married to a man that loves granola, you make granola. To Read More, Click On The recipe Title. When I told Paul I was going to make it, he went to the store and bought everything he wanted in it. Seeds, nuts, wheat germ, dried fruit, honey, maple syrup...and the list went on. 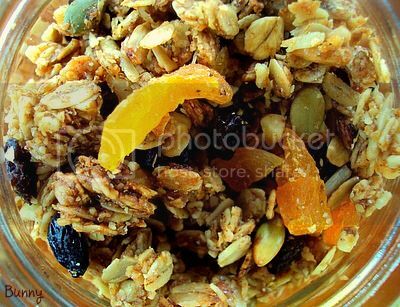 I was lucky enough to find Megan's Granola Recipe on Allrecipes, it had every ingredient in it that he brought home.. Not to mention 634 comments that sung the praises of how this granola recipe was better than anything you could by at the store...anywhere. Ok!, we have ourselves a recipe. I made this on Saturday afternoon while my husband and our neighbor were working in the garden. While it was baking my house filled up with this amazing aroma that....I can't believe I'm saying this, smelled better than any cake I've ever made. My husband walked into the house, walked back out and told our neighbor....you wouldn't believe the aroma in my house right now! The only ingredient I added to the recipe was about a tablespoon of orange zest. Before I cut an orange, I grate the zest from it and freeze it for later use. It really comes in handy. This recipe made 5 quart jars of granola, there's only one left. This recipe can be made to the taste of your family by using the nuts and dried fruit of your choice and the zest of a lemon or an orange . My husband eats this for breakfast, and he'll walk around with a jar eating it as a snack. I'm sure you'll find your own way of enjoying it...using it as a topping for yogurt or ice cream sounds good to me! Everyone that tasted this granola, absolutely loved it, seriously LOVED IT! THANK YOU MEGAN for this absolutely perfect granola! 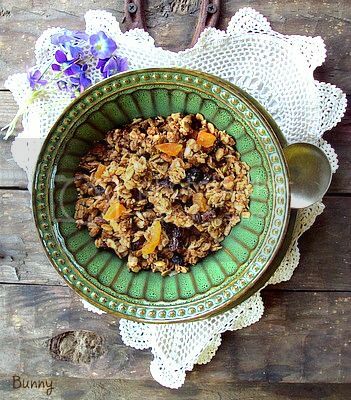 Combine the oats, wheat germ, oat bran, sunflower seeds, almonds, pecans, orange zest and walnuts in a large bowl. Stir together the salt, brown sugar, maple syrup, honey, oil, cinnamon, and vanilla in a saucepan. Bring to a boil over medium heat, let boil a minute or two, it will thicken slightly and coat the oats better ,then pour over the dry ingredients, and stir to coat. Spread the mixture out evenly on the baking sheets. It does sound like the perfect combination to start or even end the day Bunny. Sounds wonderful! I love granola! Good to see you back blogging! i never buy granola anymore--it's so easy to make at home and you can do whatever you want to it! this batch sounds terrific! My husband loves homemade granola. We love it, best, with yogurt. It's also a great guilt-free snack. I'm so glad that you left a comment on my blog (about the flan) so I could discover yours. New follower! PS: Try flan... you will love it! I've never met a granola I didn't like. I never buy granola. It's so fun to make all kinds. Now I have another one to try! Thank you Val, Lisa, Grace, Gloria, Debbie and Katrina! The way my husband is smitten with this recipe I'm starting to call it granola crack! LOL!! My daughter loves granola too...I don't. But I make it for her when she comes home. Will try this recipe next time...looks delish. This looks like a yummy granola recipe, Bunny. My husband and teenage son are crazy about the stuff, but I've never made it from scratch. I am going to get the ingredients and give this one a try. Barbara I'm not a big fan either but the aroma that came from the oven while baking this converted me! LOL!! Jane I hope your husband and son love it as much as my husband does! I am well Jane, Thank You! We love homemade granola too. This version sounds extra special. Sounds like a good combination - a recipe that uses all the ingredients your husband brought home. Sounds like it was a successful day. Once you have homemade granola,it's like you never want to go back to store bought! This recipe is one that is going into my must try folder! Love the tip about the orange zest! Renee this granola is so good that when I made it for a neighbor whose daughter was going through kemo, she wanted to make it and sell it. Everybody goes completely bonkers over this! And yes the zest is a wonderful addition, very aromatic and flavorful.